What stops us embracing an organising approach? A colleague in some recent handover notes wrote ‘while we talk a good game on organizing, we’re still really focused on mobilising’, or something to that effect. It’s a very fair challenge and one that I’ve been reflecting on since reading it. Like many in the campaigning sector, I’ve got really excited about the opportunities that an organising approach to campaigning brings – not least because I’ve been inspired by the campaigns that are using it and winning, but the day to day model of campaigning that I’m most accustomed to is a mobilising one, and getting from one approach to another isn’t easy. So I was really excited to get a copy of Matt Price’s new book ‘Engagement Organizing – The Old and New Science of Winning Campaigns‘ at the start of the month. I’d met Matt at the MobLab Campaign Con in Spain last autumn, and read some of his online articles looking at campaigning approaches in Canada. Matt is based in Vancouver, so the case studies are drawn from NGO, Union and Party Political campaigns that are north of the 49th parallel. We might look across the Atlantic to the US for most of our inspiration, but the reality is that the similarities in political systems in Canada mean we’ve probably got as much to learn for our campaigners, and it was really nice to read some case studies of campaigns and organisations I wasn’t so familiar with. But what I really like about the book is that it’s a practical how-to guide, that looks to blend together how campaigners can draw on the best of the digital. Instead of trying to push a particular organising perspective, or suggest that everything can be won by smart digital campaigning, the book explores how to blend these approaches together for maximum impact. 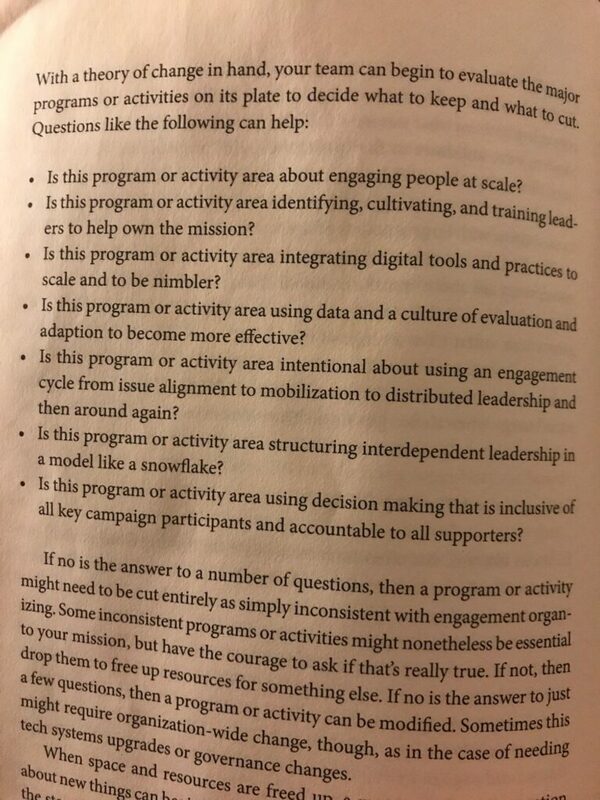 Lots in Matt’s book resonates, especially the chapter on the Engagement Cycle, as opposed to the more traditional pyramid of engagement, and also the stories of the approach of Cesar Chavez and the United Farm Workers in using house meetings as an organising approach. 1. The work is hard – Price writes about the challenge of ‘organizers entropy’ suggesting there isn’t always enough energy in the system to do useful work. That means that organisers need to keep bringing energy into a system, and that often a win can take energy away as those you’ve organised feel that their goal has been achieved. That resonated – moving to an organising approach means keeping moving away from the norm. It’s learning a new memory muscle, and that can be exhausting. As a campaigner, I need to keep bringing energy into the system, and to those pushing this work forward. 2. Resources – while the ‘snowflake model’ shows that you can build an approach at scale with volunteers, and digital tools have lowered the costs for campaigning, Price points out that even then organising at scale costs money. Something that can be especially challenging in organisation where you need to continue to demonstrate impact and value for money. Again this feels very relevant – how do I resource the slow but important work of taking an organising approach, when the mobilising approach can demonstrate ‘quick wins’. 4. Overcoming organisational inertia – Linked to the work is hard, is the challenges we can face within our organisations with systems, practices, and cultures that are hard to change. Some of that comes from the experiences, practices, and expectations of those who’ve risen to more senior roles who’s campaigning was shaped in a more broadcast era (I count myself in this), some of it is about the systems we use which aren’t built, while culture is often seen as the ‘way we’ve always done things’ and is hard to shift. I’m not sure I have any simple solutions to this, but it’s something I’d like to reflect upon in future posts. 5. We need to talk about power – One of my reflections from time spent with Hahrie Han last year is that an organising approach requires us to have more conversations about power – its something that came through again reading the book. Both about how we give it away, alongside control to those we’re seeking to empower, but also how we ensure we’re directing our campaigns to focus on where the power is. As Han says ‘movements build power not by selling people products they already want but instead by transforming what people think is possible’. I’d recommend Matt’s book for anyone interested in how to embrace a more organising approach in their campaigning.